Alpha Foundation Specialists, Inc. has the ability to design a solution to your foundation problem by accessing a wide variety of products that will meet your home's specific needs. 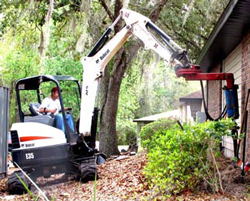 The procedure used is a tried-and-true method that lets us quickly install the products in order to reduce the time and expense of your project and limit the amount of disturbance to your yard and landscaping. Discover the area where settlement or buckling is occurring. Dig out a 2' section of soil every 7' under the footing of the building beside the affected area. An anchor or a pile is driven into the ground until soil stability is found. The pile is attached to the foundation with a lifting bracket. The foundation is lifted until it is level. The holes are then refilled so the piles and brackets can't be seen. Piles are installed until depth and soil stability are found. Concrete and reinforcing steel are placed around the piles. Core or saw holes in wall spaced per loading requirements. Drill Helical anchors through holes until sufficient torque is achieved.